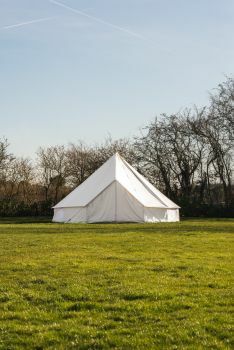 It’s a great family tent, it can be used for the ultimate glamping experience or even as extra accommodation at home (providing your garden is big enough)! At 6m long and 4m wide it easily fits three double beds, leaving plenty of room to walk around. It has two large A-framed entrances and two large A-framed windows that are great in the summer months for ventilation. We have also added two amazing sky light windows, a power lead exit and the ground sheet is stitched in. The peg ties around the bottom of the tent have an easy tightening system. This tent requires two people to erect and you can pitch in 30 minutes, it’s even quicker to take down! The tent also comes in a handy trolley bag, it simply packs away and will fit into most car boots. The space available in the tent is vast as you will see from the pictures. So, if you’re looking for the best glamping or family tent then look no further than the Meadow! Fits three double beds easily! Folds down to 110cm x 37cm x 40cm! !